Charlotte, Houston, and Salt Lake City may have been cut from the short list of HQ2 locations by Amazon, but they are still performing strong from the industrial real estate side — and are on Amazon’s watchful eye. Amazon has invested in 800,000-square-foot distribution centers in Houston and Salt Lake City, and all three markets continue to attract attention from investors, according to a recent Forbes article. REITs could outperform expectations this year in several asset classes, including industrial, according to Globe Street. Continued demand for e-commerce space, attractive pricing in cold storage, and continued attention from institutional investors could lower cap rates and keep conditions favorable for landlords. 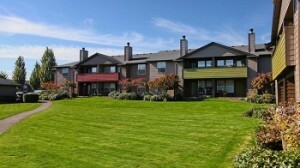 The market has also been tough on senior housing, due to above-average supply added to the market in recent years. The construction pipeline is moderating, however. This sector does farce ongoing pressures from higher labor costs. Grocery store chain Kroger plans to build two new distribution centers in Florida and the Mid Atlantic because of the demand from ecommerce customers who are looking for grocery delivery, says a recent article in the Dayton Daily News. These will be in addition to the 20 fulfillment centers, or “sheds” that the chain will invest in to speed up deliveries through the use of technology and robotics. The expanding market for food that is fresh, organic, or packaged for convenience continues to drive demand for industrial space. 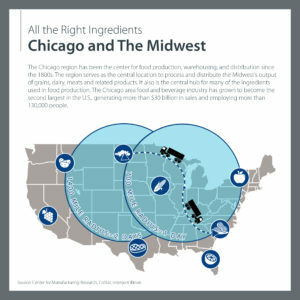 This is particularly true in the Midwest, where the central location bodes well for the processing and distribution of grains, dairy and meats that tie into the food sector. While the food industry is thriving, there remains a shortage of cold storage space in many markets. According to a Q1 2019 report from Avison Young’s National Food Services Group, the demand for cold storage far outweighs availability in many markets, including New Jersey, New York, and Los Angeles. As the industry grapples with this shortage, developers are taking advantage of new technologies to be able to build high capacity and highly efficient cold storage facilities on smaller sites, says Heine. According to the report, an estimated 4 to 8 percent of the 888.6 msf of industrial space added in the U.S. since 2016 supports the food industry with warehouse, distribution, fulfillment and related uses. Online grocery— Avison Young’s Food Services Group expects to see continued growth in processing and distribution, which will impact industrial space utilization. Cold storage— Increased demand but limited supply, particularly in primary distribution markets. Development challenges (cost, availability of land) are impacting the market’s ability to add new space. Last mile— will continue to expand to meet demands from growing online grocery and fresh food sectors. Expect to see increased competition for space near large population bases. As Q1 2019 gets into full swing, here’s a look at how 2018 fared and what’s ahead in the industrial, office and retail sectors. 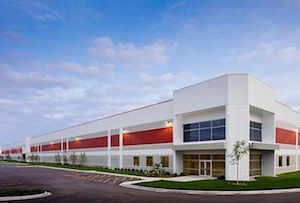 While Chicago’s office and retail sectors declined in 2018 compared with 2017, the industrial sector showed solid growth in leasing and construction, according to Avison Young’s Annual Review and 2019 Forecast. The Chicago industrial market should see 18 million square feet of new space added in the next 12 months, including many speculative buildings. This, combined with continually decreasing vacancy rates, shows investor confidence in Chicago’s industrial markets, especially infill submarkets such as O’Hare and I-88. 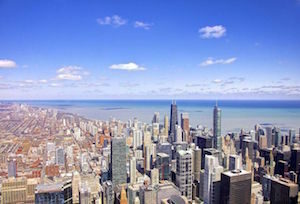 The Avison Young report notes the employment picture was also bright last year, with employers in the Chicago metropolitan area adding more than 35,000 jobs year-over-year, according to this Bisnow story. “Facebook, Google, Pinterest, Salesforce, Career Builder and Madison Capital have all recently announced major expansions in the CBD, which will increase local workforces as well as real estate footprints,” the report notes. In Q4 2018, Chicago’s speculative industrial development boom showed 19.5M SF under construction, according to research from Avison Young. That is a 59% year-over-year increase that is pushing development to new areas. This momentum has been seen for many quarters, as noted in this ULI Report. “Many submarkets that are closer to the city have little to no space available for new buildings, so we’re continuing to see speculative development moving to outlying submarkets such as Southern Wisconsin,” Avison Young principal Chris Lydon tells Bisnow. The O’Hare submarket had 4.9 MSF of new construction in Q4, increasing 50% from Q3. There is some concern about a few submarkets becoming overbuilt, however. The I-80 Corridor has the highest vacancy (12%) of any submarket, as it has seen 15.4 MSF of new construction during the past two years, with another 3.3 MSF underway. WeWork is expanding quickly in New York and other key cities. Image courtesy of WeWork. Is this the next phase of the shared office landscape? Can WeWork sustain all the buzz and move to profitability? The popular New York co-working space provider is now opening its doors to midsize companies that want to be WeWork members– but aren’t totally into that sharing concept! According to Ethan Rothstein of Bisnow, the concept would allow companies between 11 and 250 employees to have private and flexible space but fewer services than typical WeWork offices. Companies committing to the HQ service line will sign a two-year lease agreement as opposed to month-to-month. They will not receive WeWork’s traditional concierge services, full stocked pantries and kegs amenities — but would choose from a list of space features for additional costs. 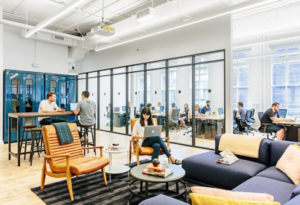 HQ by WeWork also allows companies who surpass the mark of 250 employees to use the company’s traditional office sharing locations for additional spots. With close to half of 1 million companies expected to expand beyond their midsize level within the next year, WeWork expects to soon exceed past their six office sharing locations in Manhattan. The focus is on Toronto, San Francisco and London for further expansion. While WeWork’s aggressive growth and impressive revenue stream have caught a lot of media attention, some are wondering if it’s too much too fast. The firm posted a net loss of $934 million in 2017 and $732 million in the first half of 2018, notes this Crunchbase story. Time will tell whether the growing revenue stream can sustain long enough to turn those numbers to black. Skip the fancy commercial real estate offices? That’s what some Millennials and members of Generation Z are saying — as they look beyond office space and a paycheck when they go to work, according to the 2018 Deloitte Millennial Survey. The survey captured the thoughts of more than 10,000 Millennials and nearly 2,000 Gen Z respondents globally. Younger employees want to work for companies that drive societal progress, believe in social progress, practice environmental sustainability, and keep the safety of their employees and customers at the forefront at all times. The report shows that their perceptions of businesses have changed, however, especially over the past year. The majority of Millennials now think that business leaders do not behave ethically or think outside of their own agendas. Since many commercial real estate decisions are made based on maintaining employees, business leaders should consider these factors when selecting a location for their office space and building out the space. By moving commercial real estate offices to the urban core, employers can find a diverse workforce of people and address sustainability issues. Many Millennials prefer to walk, bike or use public transportation to get to work because these modes of transportation are more environmentally friendly and don’t require car ownership. Employers should also think about building out their commercial real estate spaces with collaborative areas for training. Younger workers are looking to hone their skills in softer Industrial Revolution 4.0 areas, and they often learn best in a more casual, small-group oriented environment, for example. Everything from flexible conference space to casual breakout areas with soft seating can help with these training needs. General flexibility is also important to Millennial workers. Many of them have or would consider joining the gig economy as a supplement to or instead of having a full-time job, so they want to be able to work from anywhere—an office, their home, a coffee shop, or a beach. Employers should consider making sure their commercial spaces are technologically well-equipped to meet these needs. Collaborative spaces will also help bring employees into these offices when they do need to talk face-to-face with their colleagues. Niche retailing should be considered risky business, right? Well, think again. According to Dees Stribling in this Bisnow national story, up-and-coming retailers can still look ahead to a bright future, but, “the niche has to be right.” With some retailers across the nation closing up shop, some such as Dutch men’s clothier Suitsupply, Magnolia Bakery and Club Pilates aren’t ready to be put to rest. Suitsupply initially grew its brand in countries overseas. Unlike many other men’s clothing suppliers, the company now has big plans to expand beyond its 33 already existing stores in the U.S.. In selling, off-the-rack suits that are more expensive than mass-market but not as pricey as custom suits, the company’s niche is a perfect fit for cities like Brooklyn, Manhattan and Boston. According to the Wall Street Journal, New York City brand Magnolia Bakery is also planning an expansion of franchises over the next few years. Except this time around, the company’s strategy isn’t to leverage from the sole success of its cupcakes, but the other parts of Magnolia that just as equally establish sales. Other deep-seated commercial real estate retailers are those following the rage in the newly hot and trendy fitness world. Fitness chains such as Club Pilates, have been replenishing unoccupied spaces once filled by their failed retailer counterparts. Next year, Club Pilates foresees 5% to 10% of their locations occupying these types of retail spaces. Will this niche approach work for retailers? It just might. As the industry transforms, look for more creative approaches that target niche markets. Consider how retailers are using a mix of online and bricks and mortar, for example. Retail Stores Outlook: What’s Ahead After Toys “R” Us Store Closings? With the recent closure of 800 Toys “R” Us store throughout the U.S., many retailers are reevaluating their own retail presence. Lucky for them, there are various solutions being proposed. Jamie Ward, group head of the retail finance group in the Boston office at Citizens Business Capital, tells Midwest Real Estate News the answer is online marketplaces. By tying into booming online markets such as Amazon and Walmart, physical retailers can use these platforms for the implementation of their own shops. This provides customers greater convenience, lower prices and expanded product selection. Ward notes that about half the customers who start an online search today start it on Amazon.com. 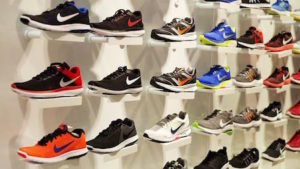 Retailers such as Nike, Land’s End and Lord and Taylor have brought in seemingly more customers through this “omnimethod” approach, as opposed to relying on just bricks and mortar stores and their own websites. Retail stores and larger malls throughout the Midwest are also experiencing the same types of issues when trying to attract customers. The efficiency, cost savings and wide selection found with online retailers is brutal to compete against. Mall owners and leasing brokers are better off focusing on customer experience with the incorporation of restaurants, bars, and gyms – to name a few. Malls that give customers more reason to traffic their facility rather than browse the web will have the ability to stay afloat. What’s the outlook for traditional retail? There is plenty of hope — as long as retailers stay mindful of changing their habits as customers change theirs. Those physical retailers who decided to stay close-minded about an “omnimethod” approach may soon find themselves descending into their own demise, leaving the commercial real estate industry with a surplus of vacancies, and online retailers a heaping of new customers. Here’s a quick look at what’s going on in commercial real estate news, along with the retail and industrial sectors. According to National Real Estate Investor, some office REITs are shying away from acquisitions for 2018. Citing rising interest rates as a factor, the story notes that REITs will now be focusing more on development opportunities. Another factor at play is the shortage of high quality commercial real estate assets in some markets — given the strong investment cycle over the past several years and the desire by institutional investors to hold on for a longer term. 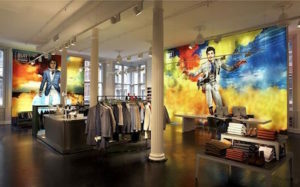 Image from Great Global Holdings, which acquired the retail holdings in this Uptown development. 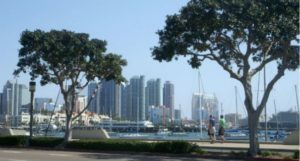 a New York investor, reports Bisnow. Great Global Holdings paid $8.9 M of the retail portion of the Wilson Yards mixed-use development. 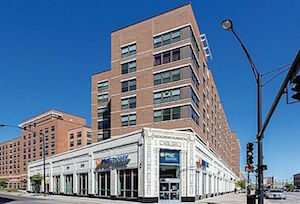 This is the firm’s fifth Chicago retail acquisition. What’s driving this activity? The race to lure the Amazon HQ2 continues, with more than 200 locations across North America vying for this prize. According to this Business Insider story, some residents are worrying about the problems associated with adding up to 50K employee into one area. Traffic, souring housing prices…you name it. Check out the story for more on who’s in the running and what this all could mean in terms of economic growth. Grocery Anchored Centers Losing Luster? 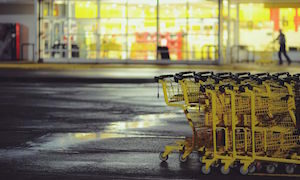 Once the darling of the commercial real estate investment world, grocery anchored shopping centers are losing some of their luster, reports rejournals.com. Citing research from Morningstar Credit Ratings, the story details how the food buying landscape is changing. While grocery stores that offered a full line of goods and has at least $2 M in annual sales were once considered “e-commerce resistant,” that appears to be changing. How will this play out for investors in 2018? Stay tuned! A Real Capital Markets and SIOR Report found investors bullish on industrial real estate heading into 2018. 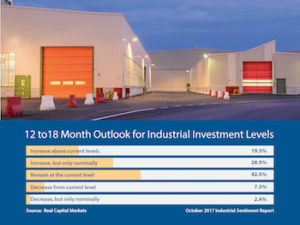 Industrial real estate investment is expected to continue its healthy run into 2018, as strong leasing, construction, and investment sales fuel the market, according to the recent Real Capital Markets (RCM)/SIOR Investment Sentiment Report. What’s driving this record investment? It’s easy to point to e-commerce as a major force, but that is just one part of the story, according to survey respondents. Volume for 2018? — 90.3% of investors and brokers across the country say investment levels will at least stay the same going into 2018, with many predicting a slight increase in activity. E-commerce Effect — E-commerce is having the greatest impact on market activity, but is not the only factor driving industrial activity. There is growth in light manufacturing, specialty food manufacturing and general corporate distribution space, for example. 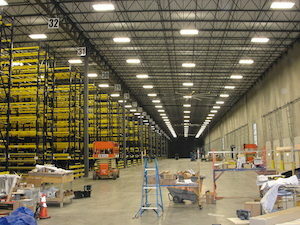 Also, many corporations are expanding their distribution space needs, moving to larger or newer facilities. Other companies are using warehouse and distribution space for newer manufacturing needs — such as recycled materials or green energy related uses. Investment sales pricing — is expected to stay the same (92.7% of respondents) or rise by 5% or more going into 2018 (33.8% of respondents). Watch out for overbuilding — 40.6% of investors say that overbuilding is the greatest threat to the industrial market. This current industrial market is unique in its longevity — and the array of market fundaments that are propelling activity. 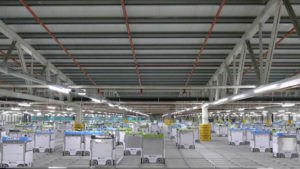 With growth in the supply chain, corporate distribution space realignment, and the continued expansion of e-commerce, it’s difficult to see an end in sight for investment in industrial real estate.